Eric Flowers aged 94 years passed away on 3rd April 2019. Eric Flowers joined the Bristol Police Fire Brigade in 1939 and served at the Gloucester Road Fire Station, Horfield. Leaving in 1942 to join the Royal Naval Air Service and became an aircraft electrician at H.M.S. Heron. 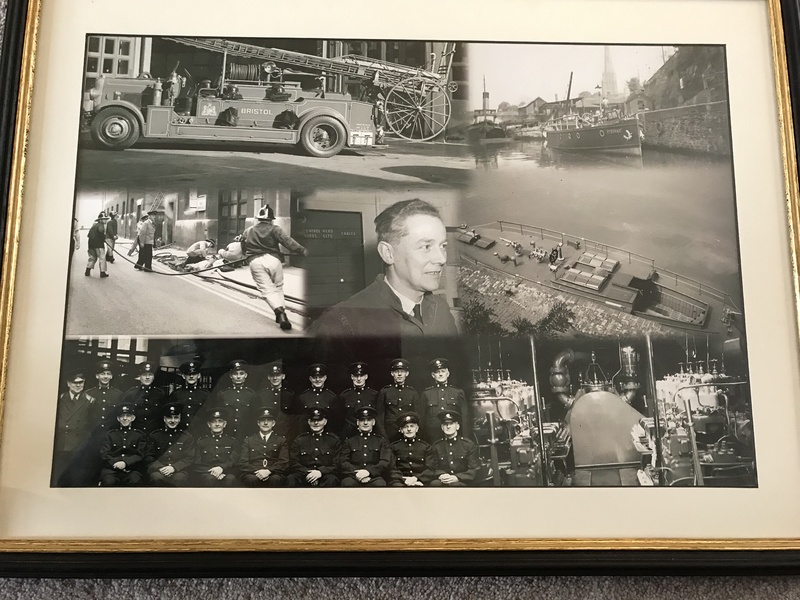 He left the Royal Navy in 1946 and re-joined the National Fire Service stationed at Weston super Mare for 10 months transferring to Bridewell Fire Station, where he spent the rest of his service. He became a Coxswain on the Pyronaut Fire Boat and became an instructor teaching and passing out many Fireboat Firemen, he was a conscientious and dedicated Fireman. Two of the major fires he attended where the Ashley Road petroleum explosion which saw the introduction of the Petroleum Consolidation Act and also the Avonmouth Oil fire where he spent two and a half days on duty with Blue Watch. in 1966 he was awarded the Queens Exemplary Fire Service Medal for rescuing two ladies and three children from a house in Hotwells. In He spent a lot of his spare time as a wood carver and was much sought after to make statues and other items. He left the Fire Brigade for a while and joined the Ambulance Service, but he missed the job he loved so much as re-joined the Bristol Fire Brigade working in the Breathing Apparatus department servicing Seibe Gorman B.A. Sets. until his retirement. After he retired Eric began to lose his site, the Blind Veteran’s Association (formerly, St. Dunstan’s) stepped into help him and was able to make his day to day life so much better. He often told the story of being in Southmead Hospital and fell out of bed on night, but he couldn’t be seen by the staff as he had fallen out the opposite side of the bed from the door. The funeral service will be a private family service.